Does the application require a disperser or mixer? A disperser is required when solid particles are dispersed in a liquid creating a colloidal suspension. if the solid is easily dissolved like sugar in water a simple air or electric mixer is ok.
What is the particle size needed for the application? If the final particle size requirement is 20 microns or greater a high-shear vertical disperser is sufficient. One caveat is the mill base (a mixture of solid material and liquid) viscosity should be greater than 30 centipoise. The mill base must have sufficient internal friction to create a “donut effect” when dispersing. The use of grinding media will be needed for low viscosity mill base systems. Organic pigments generally require grinding media to achieve the appropriate particle size. The Organic pigment’s primary particle size is below 20 microns and the agglomerated organic particles require more energy to break apart. VMA-Getzmann has several media mill models: SL – horizontal bead mills, TML basket-mill, and APS system. What size Dispermat is required? This is especially important with the high shear vertical dispersers. Selecting a Dispermat with a motor too small for the application will cause over-heating of the motor and shorten the useful life of the disperser. The correct motor size is when the majority of the dispersing applications utilize no more than 80% of the capacity of the motor. The mill base quantity and viscosity are the key factors for selecting the correct motor. A mill base quantity of one gallon with a viscosity range from 3,000 to 5,000 centipoise will require a 1.0 horsepower disperser motor. If the mill base viscosity is greater than 5,000 centipoise, than the mill base volume should be reduced. For selecting the correct media mill, volume capacity is an important criteria. Please contact your BYK-Gardner representative for a recommendation. 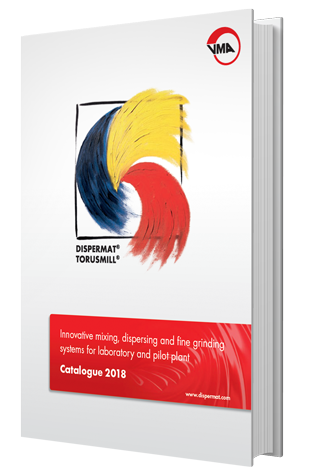 There are many features available with the Dispermat product line. Besides the basic criteria mentioned here, BYK-Gardner can assist you with selecting the additional features and accessories needed for your application.